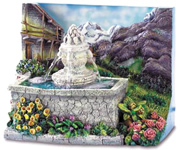 MY TREASURE TRUNK, a supplier of home décor, gifts, garden accessories and other items, has assembled a collection of 15 different designs of water fountains that bring the interest of a water feature to yards and gardens. They are made of polyresin and are weatherproof, so they can stay outdoors year round. The units range in size from the smallest at 24 inches high with a 14 inch diameter to one as tall as 42 inches with a 20 inch diameter. There are freestanding and wall mounted designs. All come complete with the pump assembly, electric motor, UL approved cord and assembly instructions. Assembly is simple and can be accomplished quickly. All of the units are individually packaged. They are classic designs and have the look of real stone. One freestanding unit, for example, features an acorn spout that shoots streams of water onto three lower tiers. Another features the classic pineapple design that signifies welcome and hospitality. It is a wall mounted unit that sends an endless stream of cascading water onto two lower tiers. There is no minimum order requirement. Wholesale prices range from $75 to $225, depending on size and design. The corresponding suggested retail prices range from $129 to $399.